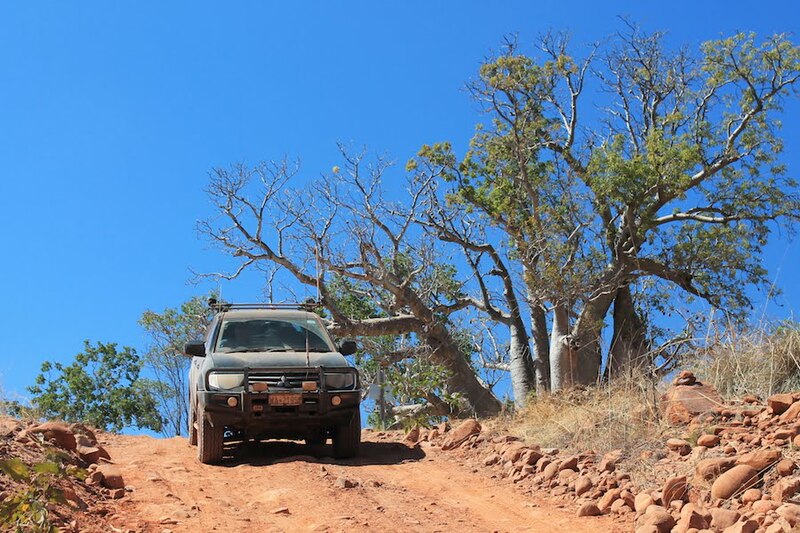 The 4,000km drive from Perth to Darwin undertaken by my husband and me last year took us through the heart of Australia’s boab country, the Kimberley region. And what magnificent trees they are. Each tree seems to have its own unique character with its life story etched into the distinctive swollen trunk. The pale, smooth trunks of the nippers taper like a candle up to a flame of branches above while the huge, gnarled trunks of the grand oldies are dimpled, pitted and scarred, a testament to the long lives they have lived. It is believed that some of the trees are an amazing 3,000 years old, quite an achievement considering the harsh environment in which they live. 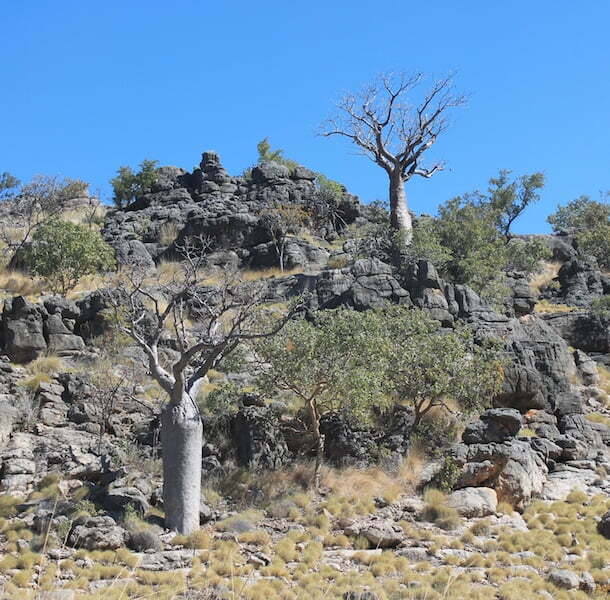 In the Kimberley there are only two seasons – the Wet and the Dry. For months during the Wet the average daily temperature is above 38°C and floods and thunderstorms are common and cyclones are not uncommon. 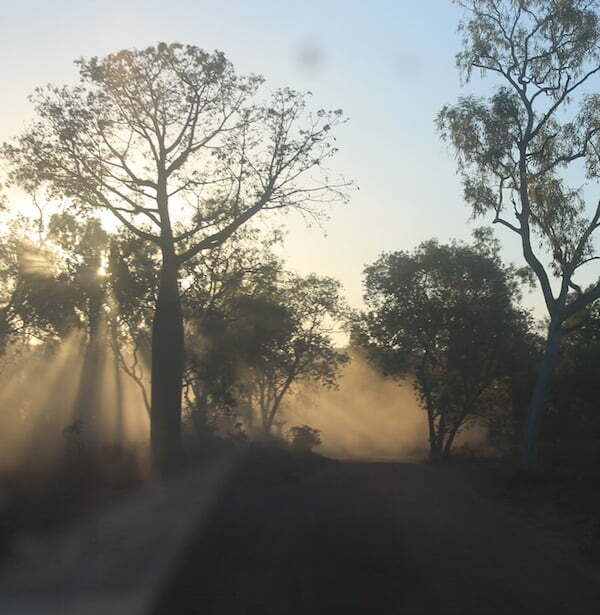 During the Dry, the weather is predictably dry for many months and bush fires can burn uncontrolled for weeks. Water taken up by the trees in the Wet is stored in the trunks until it is needed to sustain the trees during the dry. Another adaptation that helps boabs survive is that they are deciduous during the Dry so moisture isn’t lost due to transpiration. 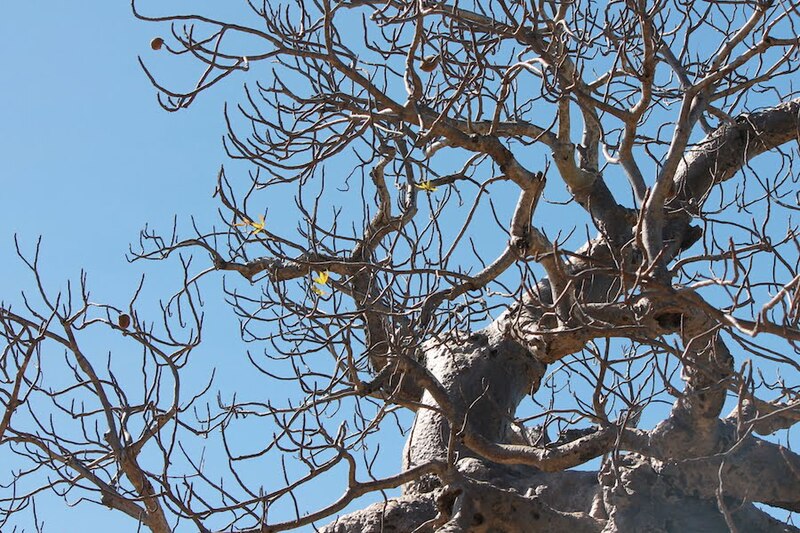 The Dry season starts in the Kimberley in April and as we were there in June the boabs were in various stages of shedding their leaves, some were completely bare while others still had a handsome canopy which provided a lovely dense shade. The compound leaves are divided into between 5 and 9 leaflets, arranged spirally. Lightning strikes ignite many bushfires and routinely strike boabs. Presumably the water stored in the trunk offers some protection against the heat of bushfires. However if the bark is burnt it peels off to reveal a fresh layer underneath. Unfortunately they have no protection (as far as I know) against lightning and are usually killed after being struck. Over time some of the soft spongy trunk tissue of older trees dies causing the trunk to become hollow. The size of the hollow can be substantial and some that we saw could easily provide shelter for 3 or 4 people. In the 1890s some of these hollows were used to hold prisoners. The Boab Prison tree near Derby wasn’t actually a prison but was used as a staging post when prisoners were being transported to Derby. Its girth is impressive at around 14m and it is said to be about 1500 years old. 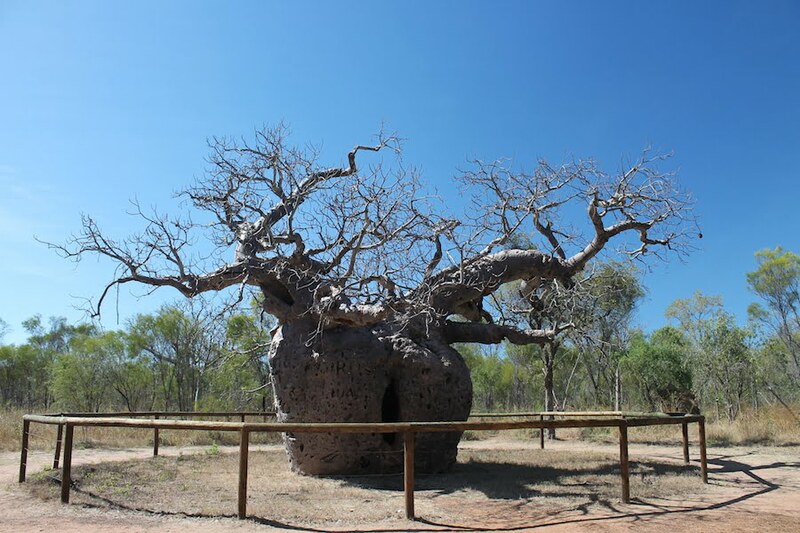 According to signage at the site, indigenous people believe that the Derby Boab Prison Tree and certain other boabs in the area are imbued with mystical powers. Sadly these trees have not always been treated respectfully as attested by their use as lockups and being vandalised with carved graffiti. Unfortunately we were visiting at the wrong time of the year to see the flowers which are described as large, white and fragrant with many protruding stamens however there were still nuts adorning some of the trees. The nuts are round or oval shaped, up to about the size of an adult hand and contain seeds embedded in white pith which is very rich in vitamins and minerals. 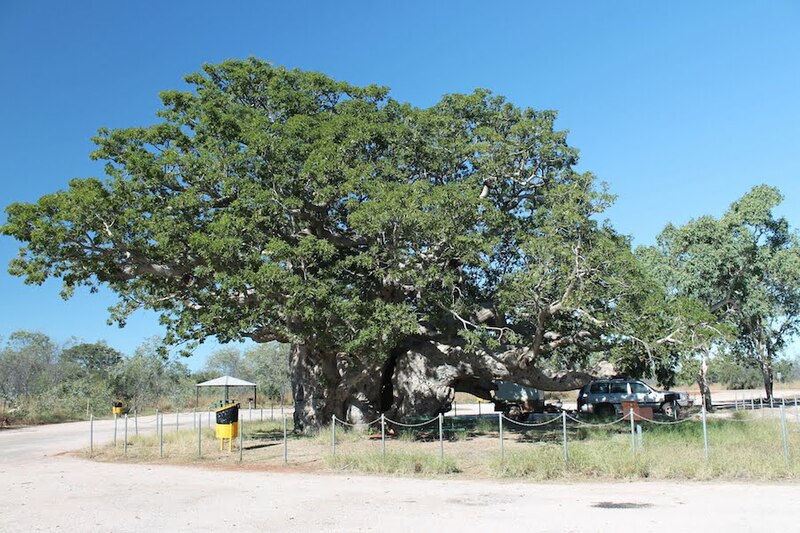 Boabs can be propagated by seed and have been successfully transplanted, most famously by the Botanic Gardens and Parks Authority when they relocated a 750 year old tree from the Kimberley to King’s Park in Perth. 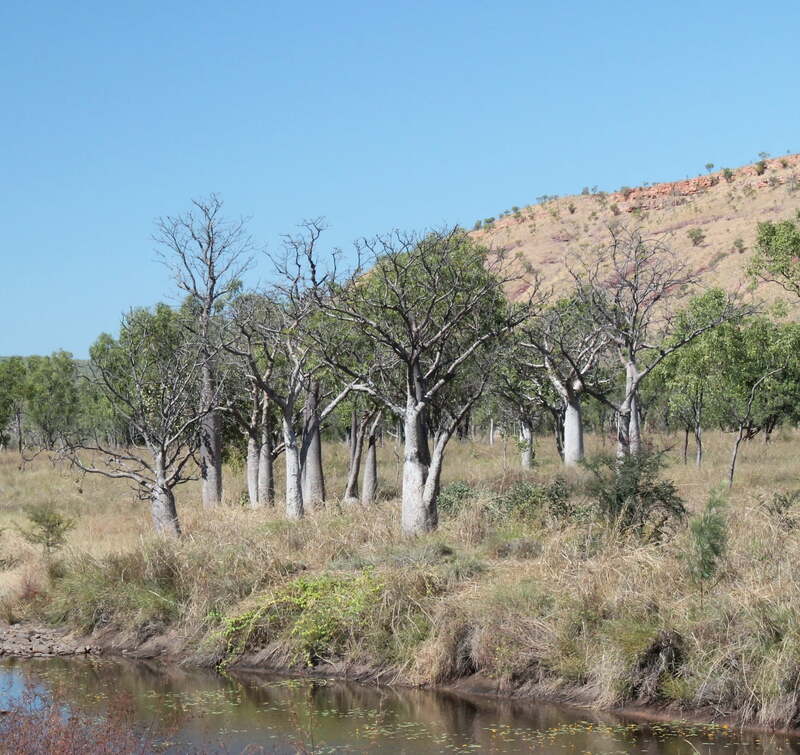 They are grown in gardens across the north and are used as street trees in various towns including Derby and Kununurra. 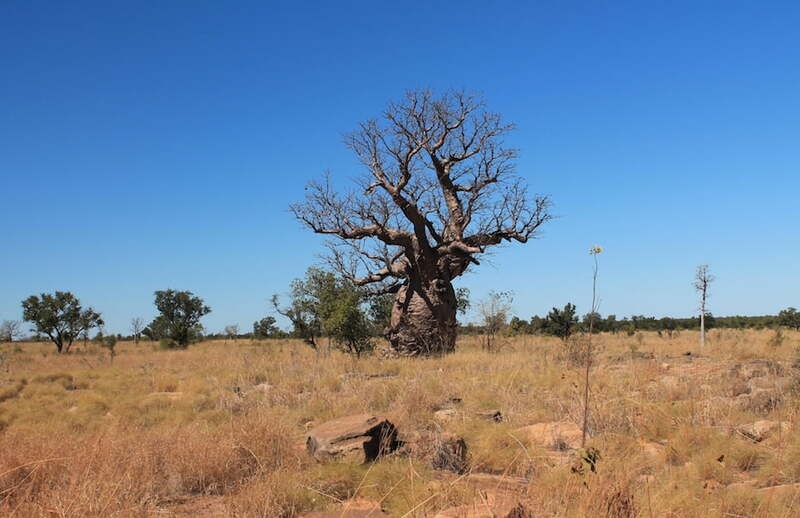 Boab is the common name used in Australia referring to Adansonia gregorii, the only Australian member of the genus Adansonia. Six other species are found in Madagascar and one in mainland Africa. As a group their common name is Baobab. 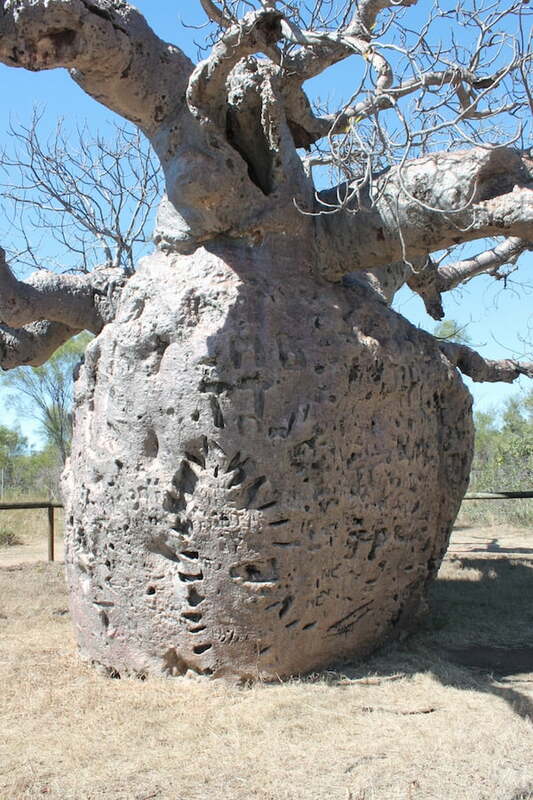 The Boab looks alien to Australia and there are many theories as to how and when it came to be in the Kimberley but so far there is no convincing evidence to support any one theory. The overall height of a mature tree is only about 15m while their swollen trunks can easily be 4 or 5m in diameter so the older trees can look rather squat and earth-bound but majestic none the less. 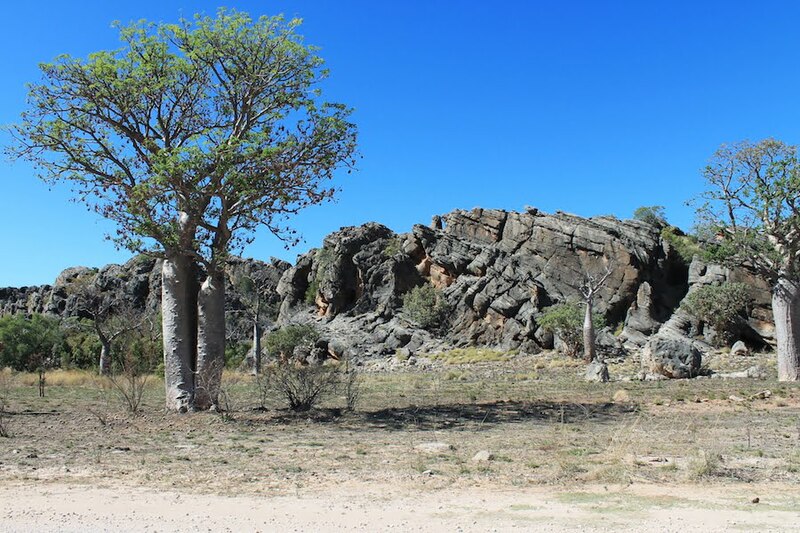 Boabs grow in a wide variety of habitats, including rocky outcrops, limestone hills, sandy plains and flood plains, in soils that can be rocky, sandy or loamy. They need high rainfall during the Wet or to have access to water from creeks or drainlines. 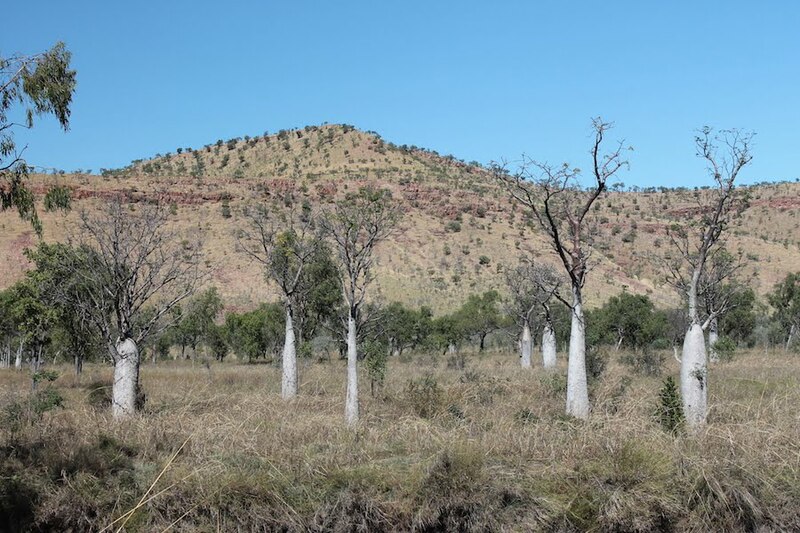 The Kimberley covers a huge area (over 400,000 sq km) so it isn’t surprising that there are areas that aren’t suitable for boabs to grow in. 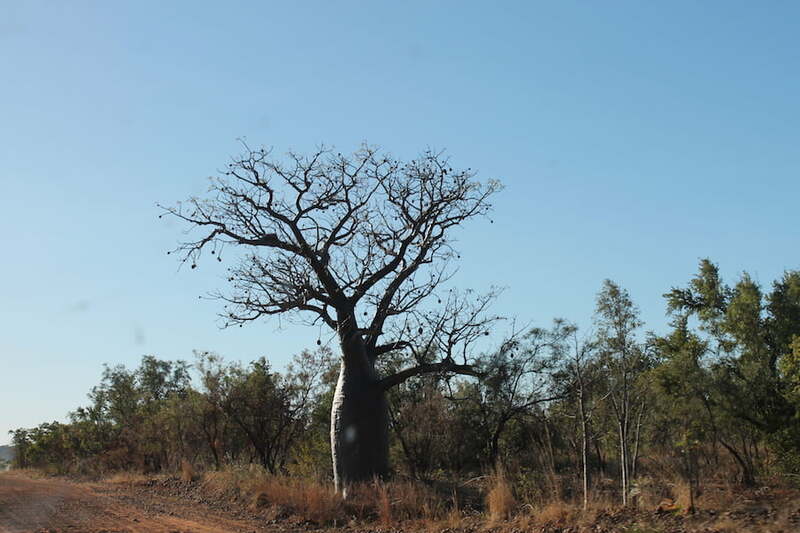 Some days you can drive all day without seeing one and then in the distance you spot the striking distinctive silhouette of an old boab, standing sentinel, or a group that looks as though they have just landed from another planet, huddled together for protection. To me they are all fascinating and I feel privileged to have seen them in their natural habitat. Thanks for the article. Do you know how much fruit they have and how long they take to grow to fruit stage by any chance? In know they are very nutritional.